After conjuring up eerie artwork for the new Suspiria movie, artist Sara Deck has now turned her talents to The Exorcist, capturing the iconic possession of Regan MacNeil (Linda Blair) that has burned brightly in the psyches of viewers for decades. A screen print that would look right at home watching over horror fans from […] The post Grey Matter Art Unveils THE EXORCIST Limited Edition Screen Print by Artist Sara Deck appeared first on Daily Dead. After conjuring up eerie artwork for the new Suspiria movie, artist Sara Deck has now turned her talents to The Exorcist, capturing the iconic possession of Regan MacNeil (Linda Blair) that has burned brightly in the psyches of viewers for decades. A screen print that would look right at home watching over horror fans from their living room walls, Deck's new Exorcist screen print has been unveiled by Grey Matter Art, and they've provided us with release details and images of the limited edition artwork that features Regan hovering like a fallen angel in unholy light. "Grey Matter Art, in release with Bottleneck Gallery is proud to present, a new limited edition screen print for the classic 1973 American supernatural horror film, "The Exorcist" by the very talented artist, Sara Deck. 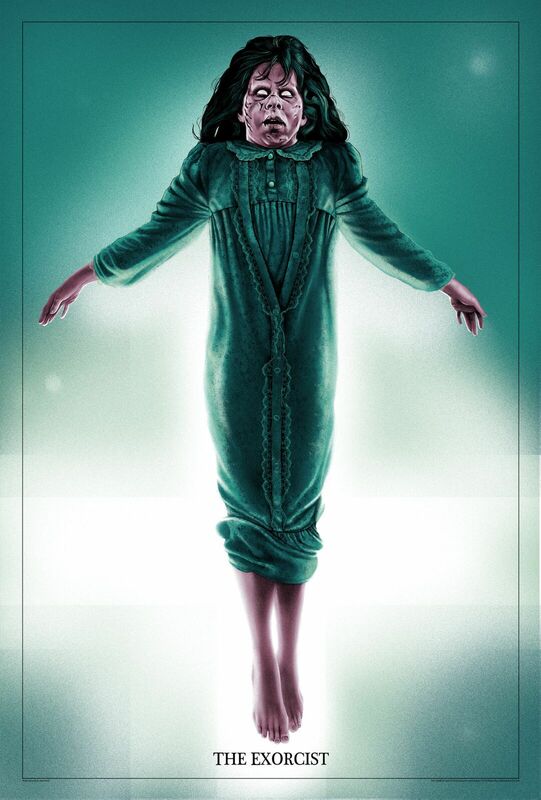 Sara's style lends itself so well to these classic horror films, and this poster is a perfect example, showcasing Linda Blair's character, Regan MacNeil in her most demonic form. "The Exorcist" Goes On Sale Tuesday, January 22nd at 12 PM est! "The Exorcist" will be released on Tuesday, January 22nd at 12 PM (est). on the GMA site and Bottleneck Gallery. For all updates and information, please follow GMA on Facebook, Twitter, and Instagram."